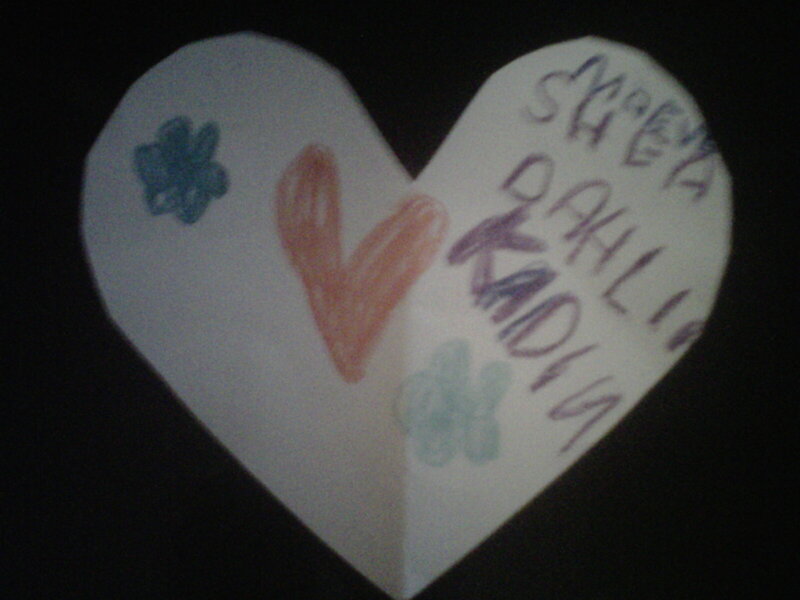 Woke to a cute lil’ note from D this AM. She is the sweetest lil’ artist ever! K was insistent that he told daddy to get his act together and bring somethin’ home from work for me ; ) K is quite funny. But sure enough, SBJ did as instructed…. an awesome card and LOTS-O-CHOCOLATE! Yipes. I think that’s all I’ve eaten today! But what a sweet day! Took D to art class in Portage Park, whipped back to get to a Dr’s appt/check-up, and then took the rest of the kiddos to meet up with D and friends at Monkey Island! What-a place! It was quite a hike out there, felt like middle-o-nowhere…. but oh so much fun! We had lots of fun with friends, and feeling so great about our surrounding community. Stayed late and cruised through a Subway on the way home. Chatting about our ventures to homeschool conferences this year. We are quite eager to get outta here, and kids very eager to connect with friends at the conferences. So we are figuring out what/when/where/how. Would also love a family trip somewhere real soon! Lil’ birdie keeps chirpin’ in my ear that we needs to head to CA : ) A visit is owed and we’d love to visit AJ and UP. AND, also need to plan for a move this year. I do think this should be the year. Of course, we could easily do one more year here…. but oh how great it would be to make the move this summer! How exciting would that be! Taxes finally filed, and I’m eager to get my certification moving. Don’t know if I’ve mentioned, but I have decided to get going with BirthWorks. Feels best. When said and done, and heard myself discussing with friends what to do next, I heard myself say that I’d be selling-out for the name if I went w/ Bradley, and those uttered words became the realization I needed. So yep…. moving forward with BirthWorks so shortly and I’m super psyched for this new venture! Yippee!